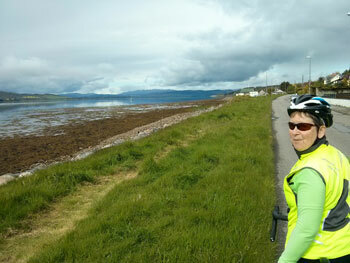 Bike ride from Berwick to Orkney in May 2015 to attend Orkney Folk Festival. Glorious sunny day, tailwind carrying us along, great views, boxes ticked. Leaving the slightly posh Bettyhill hotel, there were some long hills to climb and then descend, among sheep farms in a still-rugged landscape. But from Reay (site of the Dounreay nuclear power plant) suddenly it was gently undulating, arable farms, more populated. After lunch in the giant metropolis of Thurso, C had had enough and pedaled the last 10 wind-assisted miles to our final mainland B&B in Mey. Meanwhile I went off bagging landmarks on an increasingly brilliant sunny afternoon. The sublime: Dunnet Head, mainland Britain’s most northerly point, a beautiful and inspiring uphill ride to 360 degree viewpoint across Hoy and Orkney to the north, and the rest of Britain to the south. The ridiculous: John O’Groats, self-appointed end of the road, with no particular geographical claim; just a giant coach park surrounded by souvenir shops. 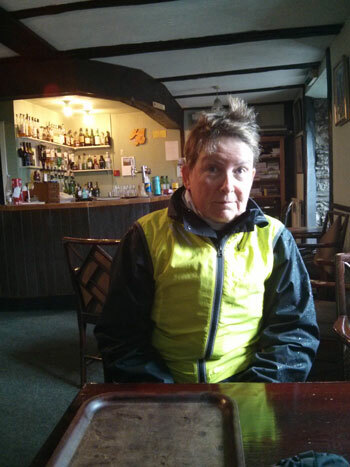 A Welsh cyclist took my photo under the JOG sign. At first I thought he said he was cycling the Holocaust; pretty weird I thought, but there are Commonwealth war graves nearby, I guess associated with Scapa Flow. 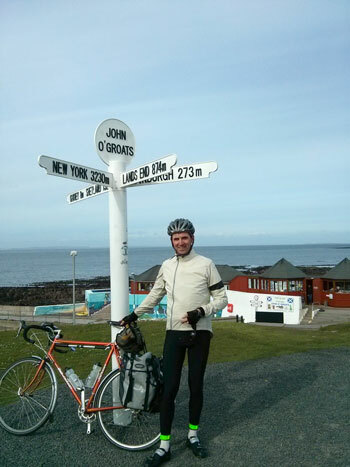 But then I realised he was cycling “the whole coast”, clockwise from Pembrokeshire. Tomorrow, 35 miles across Orkney to Stromness and the Folk Festival. Forecast more normal: heavy rain. Innkeepers are empathising with the epic slowness of our cycling in the face of strong winds, but meanwhile engaging in a Four Yorkshiremen contest. The forecast, and downpours around breakfast time in Newtonmore convinced us we’d have heavy showers all day, so we set off in full rain gear for the climb up Slochd. It only occurred to us around 4pm that it had been a lovely sunny day. Stripped off rain gear. Rained at 5. A nice day’s riding, passing sights from our last trip to the Cairngorm area, and later, the battlefield at Culloden Moor. Trad folk band at the Hootenanny pub in Inverness. Scottish wind is different from the English variety. There were no gusts, just an endless flat blowing like the egress of a hair dryer. We battled into the teeth of it and up the pass, light in gradient but heavy on gravelly, bumpy surface, and alternate sunshine and downpour. It must have been the slowest 15 miles we ever cycled. By the way, it was beautiful at the top. Last night we stayed in Birnam (of the Scottish play) at a guest house run by a charming naturalist. We bombed back to Perth by bus (reversing the last 2 hours of our ride) to see Lau play at the splendid Perth concert hall. Mesmerising as ever, and, to Caroline’s shock, they stood up! (Folk music is not used to such radical changes of direction).